The 100-ft mooring mast on the Ewa Plain, Oahu, Hawaii during construction, 1925. 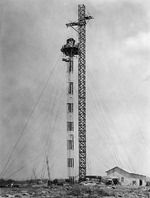 The 100-ft mooring mast on the Ewa Plain, Oahu, Hawaii shortly after completion, July 1925. The 100-ft mooring mast on the Ewa Plain, Oahu, Hawaii, Aug 15, 1929. The mooring mast on the Ewa Plain, Oahu, Hawaii after being shortened to 50-ft, Mar 1932. The mooring mast on the Ewa Plain, Oahu, Hawaii after being shortened to 50-ft, Mar 23, 1932. A Boeing 314 operated by Pan American Airways as the 'California Clipper' passes the Ewa mooring mast and the Ewa Sugar Mill on approach to its Pearl Harbor landing area, 1938. Aerial view of Ewa Field, Oahu, Hawaii, Jul 12, 1940. Although clearly an airship mooring field, this photo was not taken from an airship since no airship ever came within sight of this field. Enlisted barracks in a “tent city” at Marine Corps Air Station Ewa, Oahu, Hawaii shortly after commissioning, Feb 1941. Marine Corps Air Station Ewa, Oahu, Hawaii shortly after commissioning, Feb 1941 showing the crow’s nest of the mooring mast converted into the airstrip’s control tower. The mooring mast at Ewa Field, Oahu, Hawaii converted for use as a control tower, Feb 13, 1941. Grumman F3F “Flying Barrel” fighters fly by the mooring mast at Marine Corps Air Station Ewa, Oahu, Hawaii, mid-1941. SB2U Vindicators and F3F “Flying Barrels” on the pad viewed from the tower at Marine Corps Air Station Ewa, Oahu, Hawaii, mid-1941. Note the false color added to the photo after the fact.